Yesterday was another fun-filled day here! We started the morning by heading to the nearby Deanna Rose Farmstead. I hadn’t taken the boys there in several months and we didn’t have any plans for the morning so decided that was the perfect place to head. The boys were most excited to see the baby goats, as they always are. There’s a special pen where you’re allowed in with the baby goats. 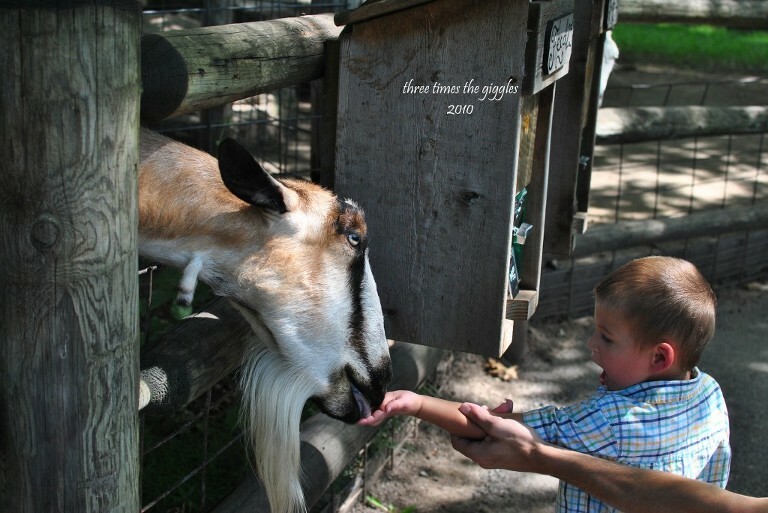 If you want to, you can even pay $1 to get a little bottle of milk to feed the goats. The boys have always loved that part of Deanna Rose. This time was a bit different though…. The baby goats were super aggressive when they saw we had a bottle! Guess they were all hungry early in the morning. I think the boys each tried holding the bottle for all of 15 seconds each before they’d either drop the bottle or a goat would yank it out of their hands. Nick and I got to feed the hungry goats instead. 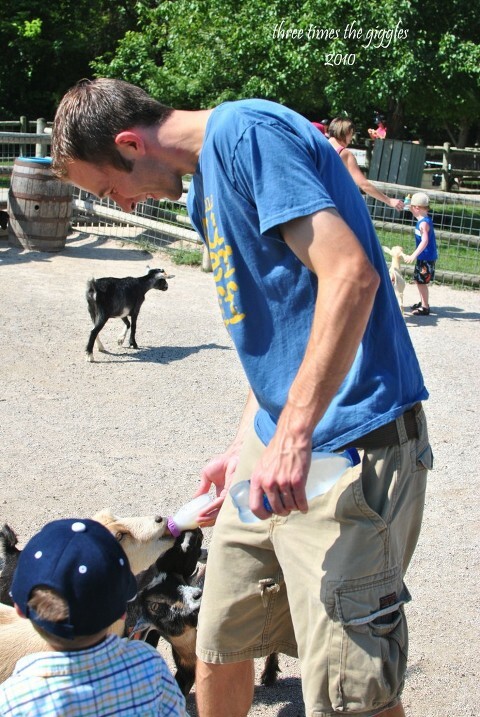 Nick just wanted to get in some bottle feeding practice for all the feeding he’ll get to do this winter. 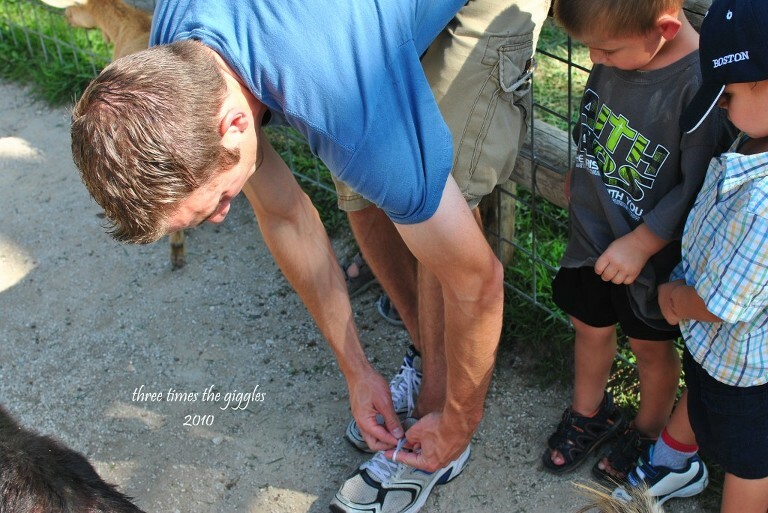 While I’m sure you all are happy to know that Nick knows how to tie his own shoes, that’s not why I included this shot. See, just seconds before I snapped this a goat had untied Nick’s shoe, and seconds before that the same goat had a mouthful of Chase’s shirt! Seriously, aggressive baby goats! The boys were able to feed the bigger goats, thankfully! Jackson thought it was pretty funny when the goat licked the food off his hand, and I thought it was pretty funny the way Jackson kept his mouth open while the goat ate. 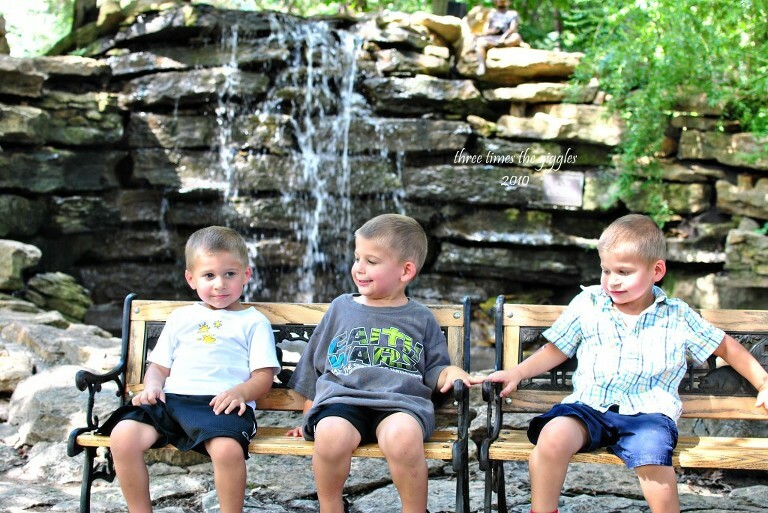 After a picnic and some playtime at the playground just outside the Deanna Rose entrance, we loaded the boys up and headed to our second adventure of the day… taking the boys to their first movie theater experience (to see Toy Story 3)! The boys were in awe from the moment we walked through the front door, to the bathrooms, to the concession stand, by the size of the screen and by just how loud the theater was. They loved it all though and did fantastic for the 2 hours we sat there! When we got home they called our TV a “baby TV” because it was so much smaller than the movie theater screen. Poor, deprived children! Hi Helen! Looks like you all had a fun and interesting time!